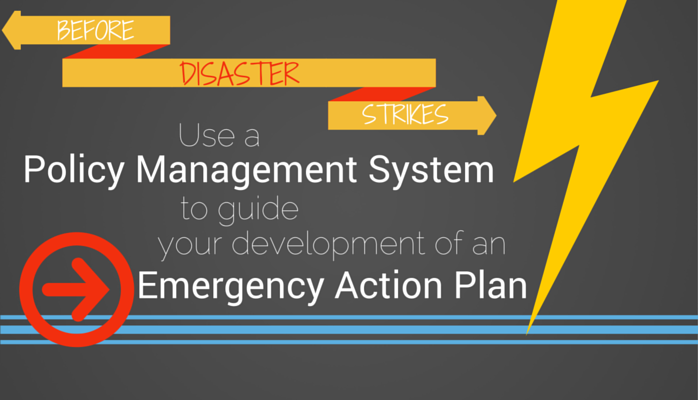 The first step in building a plan is to create policies for disaster recovery and then define detailed procedures for each policy. All paper files — not just your policies and procedures — should be converted to electronic files when possible, and stored on secure servers. You’ll want to ensure that you involve and get input from your team in creating these policies and procedures, as well as have upper management approve them. According to ISO standards, disaster recovery plans should not only include the above information, but also the purpose and scope of the plan and document history. Document history needs to include: dates of revisions, as well as details about what revisions were made and who approved the revisions. Central document repository – Quickly search and access the most up-to-date policies and procedures from one location. Security – Keep your critical documents secure behind your own firewall or through your on-premises SharePoint server. Role-based user access – When creating policies and procedures, ensure the appropriate upper management executives review and approve your policies by restricting and controlling access so they see only relevant documents. Version control – Follow ISO standards with version history, and automatically keep track of dates of revisions, edits made and who made and approved what revisions. Custom quizzes and policy acknowledgments – Most importantly, ensure your employees are prepared and know what to do if disaster strikes! Quiz your employees on critical steps of your plan, or have them sign off electronically to ensure they read and understood the related policies and procedures. Next step: Protect your policy and procedure files by storing them in one central depository, and not on paper, with Policy Management Software. Plus, see how you can quickly get your employees up-to-speed on important disaster recovery policies.